I was crushed when the Christopher Priest era of the Black Panther ended. 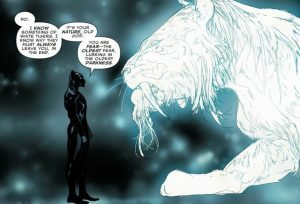 Granted the last year of the series had been a bit off with introduction of Kasper Cole as a new Black Panther who eventually assumed the mantle of the White Tiger. Not that it wasn’t an entertaining tale. It was just drastically different than what the series had been. Yet as a reader the writing was on the wall that the series was going to come to an end and I was sad. It had been a great run and a fantastic time to be a Black Panther fan. It seemed that Marvel wasn’t finished with the Black Panther either as it was soon announced that Hollywood Director and President of Black Entertainment Television (BET) Reginald Hudlin was launching a new Black Panther title with superstar artist John Romita Jr. I didn’t know how to feel. I was excited that the Black Panther was going to continue his adventures in a monthly title but nervous as to how someone other than Christopher Priest was now going to guide the adventures of the King of Wakanda. Hudlin and Romita Jr.’s Black Panther launched in the spring of 2005 and from the beginning it had a different vibe than Priest’s run had had. Hudlin delved deeper into T’Challa’s history during his run and began his series with a history lesson on Wakanda as well as how T’Challa had become the Black Panther. He went further into his then unelaborated on back-story. Black Panther vol. 4 also introduced new members of the royal family, most notably Shuri, T’Challa’s half sister and fellow candidate for the roll of Black Panther. I wasn’t into Shuri at the start. It was jarring for me since I had read Black Panther for years and to suddenly have a new ‘family’ member pigeonholed into the story didn’t sit well with me. But within a few issues I was warming up to the young royal and now I’m not even sure what my original reservations were other than a fear of change. 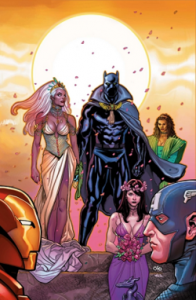 One constant during Hudlin’s run was he spent a lot of his time on T’Challa’s love life. As king T’Challa needed to find a worthy wife and procreate future kings of Wakanda who could assume the mantle of the Black Panther. This led to a brief courtship (or reunion) with Ororo Munroe (Storm of the X-men) as it was already established the two-shared time together when Storm was worshipped as a weather goddess and T’Challa was on a walkabout prior to becoming king but Hudlin added more depth to their youthful romance. The two marry and honeymoon as members of the Fantastic Four as they replaced Sue and Reed for a time in the wake of Marvel’s first Civil War. To be fair I didn’t love Hudlin’s run on the Black Panther when it was originally released. I didn’t hate it either. I think the main issue was that I had loved Priest’s run so much that I was using that as my barometer for Hudlin’s run and that wasn’t fair. I recently went back and read Black Panther vol. 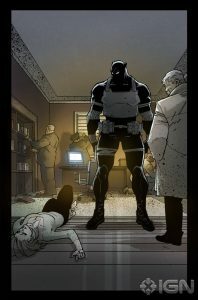 4 again and although not my favorite Black Panther comics I did like them more than I did at the time of publication. I liked the royal intrigue present in this Black Panther series. I now enjoyed the introduction of Shuri and the role she’s played in T’Challa ever since. The distinctive look of the Dorje Malije so apparent in the current Black Panther series and on every Black Panther movie trailer or ad was created in this volume. I did not enjoy how Black Panther was forced into the constant Marvel Events of the time period, as Hudlin was required to weave House of M, Civil War and Secret Invasion into his series. I also did not enjoy the time spent in the Fantastic Four. If it had just been in the regular Fantastic Four title it would have been fine but it took over the Black Panther title as well and I just didn’t find it that interesting. I wanted Wakandan adventures, not alternate reality and space adventures. Those are great in the Fantastic Four but to me not part of what the Black Panther title should be. Hudlin’s first volume ended in the mini-series Doomwar that saw Latveria and Wakanda go to war over Wakanda’s Vibramium stores. 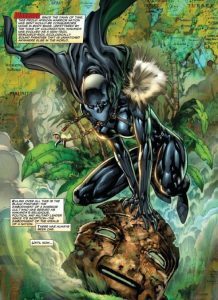 Doomwar concludes with Shuri as the new Black Panther and Queen of Wakanda while a depowered T’Challa leaves Wakanda to rediscover who he is when not the Black Panther. Luckily it coincided in the wake of Shadowland, an event that saw Daredevil take over the Hand and become corrupted by their influence. While Matt Murdock took to the road to figure out his place in the world he asked a depowered T’Challa to protect Hell’s Kitchen and we got the wonderful Black Panther: Man Without Fear and Black Panther: the Deadliest Man Alive titles. I really enjoyed this take on the Panther as crime writer David Liss and the great Francesco Francavilla took Black Panther to the dark and gritty streets of Hell’s Kitchen and got away from the court intrigue and Wakandan politics. It’s a dark story that sees T’Challa take on the identity of Mr. Okonkwo, an immigrant from the Congo who takes over a diner to be closer to the people as well as learning where his other skill set is needed. This was a fun and different storyline for the Black Panther that drops Black Panther into gang wars and conflict with organized crime. It added mystery and vigilantism to the title that was vastly different from what the status quo had been for the years before yet fit in nicely with where T’Challa was at the time. I would have liked to see this title continue and have a more street level Black Panther for a little longer but Marvel wanted a return to Wakanda as well as a return of Reginald Hudlin. Black Panther volume 5 was a brief series that saw T’Challa return to Wakanda but not as King but rather as an advisor in the court of his sister Shuri, who was still the Black Panther. It’s a short volume that had some interesting ideas but really never got into an enjoyable groove. It saw T’Challa regain the mantle of Black Panther along with Shuri (so there were two Black Panthers for a time) and seek revenge on Doctor Doom for the events of Doomwar. It lasted a little over a year and then disaster happened, literally as Wakanda was treated most unkindly by the events of Avengers vs. X-Men. During the course of the story T’Challa offers safe harbor to the beleaguered Avengers team as they tried to stop the Phoenix Five from taking over the world. 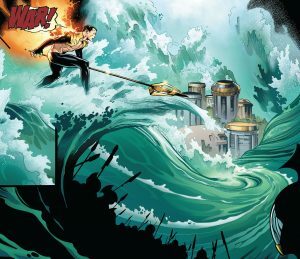 In retaliation to this Namor uses his Phoenix enhance powers to destroy Wakanda with a massive tidal wave. Unfortunately the ramifications of this event would be felt for years and I do mean unfortunately as Avengers vs. X-Men, to me, was a bloated waste of an event that was more forced than needed. It had a stellar creative team but did little for me. 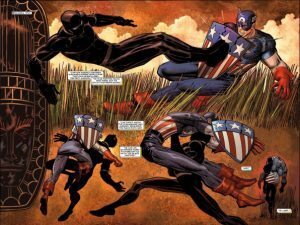 It did do a lot to the Black Panther and as the Avengers relaunched under the guidance of Jonathan Hickman the Black Panther would play a central roll in the cataclysms to come. Teams became the avenue to read the stories of Black Panther in the wake of vol. 5 and the ramifications of Avengers vs. X-Men and the devastation of Wakanda. As Marvel began its long build up to Secret Wars Jonathan Hickman brought T’Challa onto his New Avengers as a member of the Illuminati tasked with destroying worlds during their incursions into the 616 Marvel reality. This era of the Avengers and New Avengers was interesting and entertaining but I never liked how much death was laid at the feet of some of my favorite iconic heroes. I did like the brilliance of this Illuminati and enjoyed that T’Challa was among Marvel’s intellectual elite. For me the best aspect of these series was the pained alliance of T’Challa and Namor. The hatred yet acceptance that they needed each other was beautifully written and their time together in the Secret Wars was one of the highlights of that great comic event. After Secret Wars Wakanda was restored and once again looking to the peak of scientific discovery and helped fund the Ultimate Project. Led originally by Captain Marvel in the Ultimates and then America Chavez in the Ultimates² , the Ultimates were a science-based team that dealt with cosmic and larger threats to the Marvel Universe. Both volumes of the Ultimates were wonderfully written by Al Ewing with incredible artwork first by Kenneth Rocafort and then Travel Foreman. I loved the two volumes of the Ultimates. It was a high concept sci-fi super hero tale that dealt with Universal Crisis and reality altering situations and the Black Panther was at the heart of it. I have thoroughly enjoyed the use of the Panther’s mind and intellect over the past few years. Where Priest focused on his strategy skills it has been his genius that has set the Panther apart from other heroes in the recent years and I am all for that. 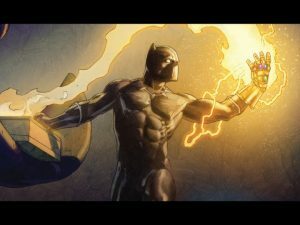 With the Panther as a starring role of first the New Avengers and then the Ultimates it was only a matter of time before the Black Panther was back in his own title or titles as it has become. Black Panther vol. 6 launched under the guidance of acclaimed author Ta Nehisi Coates. The most current volume of Black Panther and its ancillary titles World of Wakanda and Black Panther & The Crew have been a wonderful melding of all things Black Panther going back to his famous introduction in Fantastic Four #52. The current volume of the Black Panther has politics, religion, science, mystery, intrigue, war, and of course super heroics. Coates is a top-notch writer and has orchestrated a compelling plot that has played out over the past few years. I’m excited to see where it goes and hope for a long sustained run on the title.